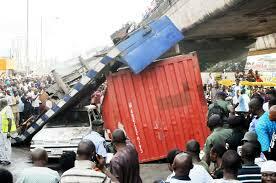 Federal Road Safety Corps (FRSC) on Friday said Nigeria lost N39 billion to trailer/tanker crashes in 2018. The Corps Marshal, Boboye Oyeyemi, disclosed this at a meeting with Transport Stakeholders in Abuja. “This is not a pleasant story; it is a serious matter and loss to the economy; this gory tale is not the best for the country,” he said. He decried that over 90 per cent of tankers and trailers were over 30 years old, saying that maintenance was a serious matter that needed to be addressed. “It costs about N50 million to buy a new head for a tanker excluding the body, while registration and insurance would cost about N60 million to put a tanker or trailer on the highway,” he said. He also said the number of crashes which involved trailers in 2017 was 522 as against 425 in 2018. “The number of fatal crashes involving trailers in 2017 was 253 as against 169 in 2018. For tankers. The Corps Marshal also said that the damages caused by the articulated vehicles affected roads and the environment and was a major loss. ”As of today, 90 per cent of mobility is on the road because of the vandalisation of pipelines. ”The petroleum products and other products are moved from the seaports to the hinterlands,” he said. While calling for decisive actions to tackle the problem, Mr Oyeyemi appreciated the effort of the federal government for rail transportation. Kassim Bataiya, President National Association of Road Transport Owners (NARTO), said accidents involving tankers was disheartening and was a great loss to the economy. He said Nigeria has had no transport policy for the past 30 years to guide the conduct and behaviour of drivers. Mr Bataiya urged the corps to involve the legislature and Judiciary in such stakeholders’ meeting to ensure that drivers who caused road crashes were punished. “We need the Judiciary. Why there are crashes is because there is no punishment. We need offenders to be punished to serve as deterrence to others,” he said. He also called for Private-Public Partnership for construction of roads across the country. Salimon Oladiti, National Chairman, Petroleum Tanker Drivers (PTD), said the union had embarked on the n training of tanker drivers with a view to reducing road carnage. He decried that 75 per cent of tanker crashes occurred at night, saying the union would do its best to check the trend. President, National Union of Road Transport Workers (NURTW), Najeem Yasim, called on FRSC to ensure more enforcement of driver’s licence to check untrained drivers from plying the roads. Similarly, President Road Transport Employees Association of Nigeria (RTEAN), Osakpanwan Eriyo, represented by Edi Nwabeze, appealed to FRSC to strictly enforce acquisition of licence by drivers.